Can you imagine the best brains of the country showing off the ‘horse dance’ to ‘Gangnam Style’ at the sacred research labs and lecture halls? 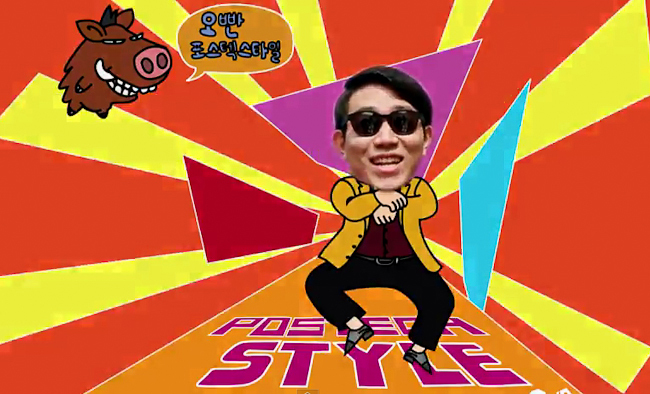 On November 17th of 2012 a jocular video was uploaded on Youtube: a parody of the famous “Gangnam Style” music video of the Korean singer (now a “world star”), PSY. The parody went viral rapidly, attracting more than 10,000 views in just two days. The video shows professors and students collaborating to create what’s called “POSTECH Style.” POSTECH University (a global leader in science and technology), who sets it priorities in high-quality and high-impact education and research, the institution often exhibits an intricate and a rigid vibe. At a place like POSTECH then, it is unimaginable that students with thick glasses and piles of books hovering over them can dance this good. It was the professor’s strategy and the wittiness of the students were what made the POSTECH Style possible. Those who appeared as special guests were member of the POSTECH student clubs like soccer, basketball, cheer leading, tennis, and classical music, etc. Yet, the most contribution to the video was perhaps from ‘Ctrl-D’, the dance club crews who choreographed all the dance moves in the video and pulled off astounding break-dance moves all throughout the parody. If we have a closer look at the video, we can find various sceneries and interesting parts of the POSTECH University. At the very beginning is the POSTECH Biotech Center, which was established with the collaboration of POSTECH’s outstanding researchers of Biotech studies and POSCO’s high technology. The center helped the development of national businesses and the improvement of human welfare. To put it easy, it’s a center for researching new vaccines in curing incurable diseases such as cancer and septicemia (blood poisoning). Another spot to note in the beginning of the video is the Jigok Pond, one of POSTECH’s most famous attractions for the cherry blossoms during spring flower season. Where the POSTECH girl alike Hyuna appeared to seduce PSY was at the Tae-Joon Park Digital Library, known for it’s a spectacular design which received the Architect Award of the year. You can also see POSCO International Center where POSCO holds international scholarly conferences with scholars from all over the world. Students and professors hope this video may create global viral like PSY’s original Gangnam Style video, with good will and common purpose. Now, are you ready to shout?